When I started doing social media marketing with Facebook I wanted to know how to use Facebook to promote my business. At first I thought of doing a Facebook Page for my website business, but frankly I did not see the benefit in creating one. I did not see how it would help in getting quick leads. Between the set up and the posting of content and links, if you do not have a huge following, no one in your target audience is going to see it. I always get people asking me to “Like” their Facebook page. Likes do not convert into sales! And when you look at many of these pages there is hardly any interactions. I needed to find a better and quicker way to get results. I then remembered what helped me a lot on Google+ (Communities), so I went searching for the Facebook equivalent. That is when I discovered Facebook Groups. Interesting, but would it give quicker results? So like most things I dove in and tried it. 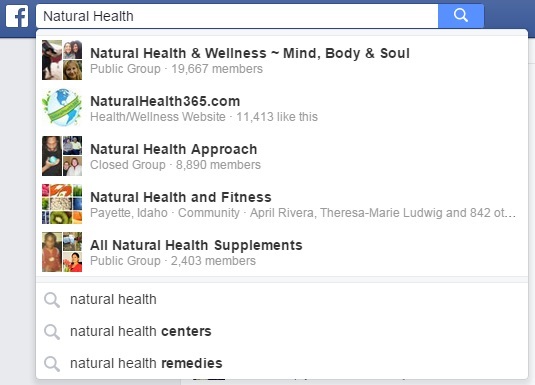 To find Facebook Groups in your niche you want to use the Search Bar in the upper left corner of the screen. As you can see in the image above I started to do my search for people into Natural Health & Wellness. I started by typing “Natural Health” and got 3 groups. I am not interested in pages or websites, so I continue my search by adding the symbol “&” which then gives me other results. As you can see in the image above, I still have 2 of the 3 groups from the top image, but now another group has been added to the list. You will want to continue searching for groups that would be great for sharing your website links. Make sure to click on the groups that interest you and read their posting rules. When viewing the groups you are thinking of joining, you may see them say either “Public” “Closed” or “Secret” Group. If you are wondering what that is, here is a quick explanation. How active do i need to get in Facebook or can I just post as you did, or are you spending other active time there as well?I have an account but have used only a couple of times and I never respond on Facebook.Do I need to start spending time there? Hello, I never had a Facebook page until I started WA. I named it with the name of my website and left out all of the bio information so whoever sees my page does not see my name, where I live, my phone number or anything like that. I have invited my friends to it is for business purposes. I hope I helped give you some ideas. Thanks Jeffrey that does help.I will keep posting my post and keep it for business as well.Have great day. You should be somewhat active so as both Facebook and others who eventually click on your link know you are a real person and not some spammer. Just so you know, I am not advocating the use of a Facebook page in this tutorial because you can get quicker and targeted traffic by joining relevant groups. That being said, a Facebook page will yield results in the long run but only when you get people in your desired niche to find your page, follow it, and post importantly...make a purchase. By joining a relevant group you are going to where your target audience is hanging out and putting your offers in front of them. Doing both, joining groups and starting a FB page is best. Okay I have to stop resisting and get with it.Thanks Robert. Thank you so much, Robert, for this training. This is what I need the most for my campaigns. You have so simplified the process that I think it will not take me time to master the process, thanks. I have a question though; How do I know or enquire whether or not I can post my sales pitches in a particular group given that they are created for specific purposes by the creators, which may not admit of advertising by others, or is one free to advertise on all groups? I appreciate your earliest response, please. First you should only join groups that are in your niche and secondly read the group posting rules before you post. Look at what others are posting. Question about this. If we don't yet have a niche (I just joined) but would like to promote WA through various FB groups, can we do that too? Once I get a niche that I'm interested in running with, I can then find relevant groups and post links to my website or others as well. Yes. You can promote your WA affiliate links in make money online and work from home Facebook groups. But be careful and make sure you read the group rules for posting links. This is very informative and I will definitely share this on my Facebook. I have been avoiding using Facebook because I couldn't see the way of getting traffic to a Facebook Page other than my family and to a few friends. I am going to also make a list of sales pitches. When you mention 'sales pitches', do you mean calls to action? Yes Monica. A sales pitch is the same as a call to action. Don't avoid any social media because you need to be in it in order to grow your following of interested target audience. It will take time and effort for you to grow it, but if you do not make the effort it will never happen. Thank you, Rob, for answering my question. I'm not going to avoid social media anymore. Time doesn't wait and while this is an uncomfortable step for me to take, I also realize there can be no growth or success. I'm working on my calls to action list. This is a great tip. I am not familiar with FB and so far, limited success. Like what you said, the level of engagement in my FB page is close to nil. Joining relevant groups may be more exciting but I have a question. For example, by joining groups like Make Money Online, isn't everyone also promoting their own products? I think that's a good question. I've been considering to stop posting on some of the Make Money Online FB groups I joined exactly for that reason. It may be a matter of choosing the right groups though. Best of luck to you, Jude! Hey Robert, your training modules are absolutely fantastic. You have set them up with step by step instructions in plain English. You have become a favorite of mine and I appreciate all of your contributions. Quick question, do you recommend setting up your own personal Facebook Group and do you think it is beneficial? Thanks again. Thank you Mike. I am honored that you have found my training tutorials as your go to source for knowledge. As for your question, setting up your own group can be beneficial if you if you have the time to constantly moderate it. You will also have to do some promoting of it to foster its growth, especially if it is in a competitive niche. Hey Robert, I noticed the first way is more effective as I got people to be more engaged on the posts. So I replied to their comments saying that I'd send the links to their inbox, which I did. But do you know how you can tell whether the person sees the message or not? Yeah, it happened quite a few times that the person didn't see the inbox message. What's your suggestion on that? I normally tell them by replying to their comment, that I just sent the PM and to check all of their inboxes. That is a pretty good idea, asking for an inbox to send to. I think I will have to try that myself. Thanks for the idea. Yes, Facebook will block people that post too many affiliate links in any particular group within the comments. That is why using the inbox is much better if you are getting a lot of replies. Great post! I have to try this method with FB groups. I agree the likes do not get you signups, people just usually simply like "Your page and everyone else page" that was sent to them. From there, they completely forget about the page you sent to them. I know myself when I was using Facebook, that I got so many "like my pages" that I would forget how to get back to them. Also noticed you said this works on Google+, I have been wondering for awhile if anyone actually looked at Google+. So, you have cleared my thoughts on that. Yes, Facebook Pages really do not get a lot of conversion activities beyond just page likes, unless the page owner spends many weeks and months promoting it. However this is still not as effective as advertising in a group where your target audience hangs out. Just make sure you read the rules of the groups you join. Not all groups allow you to advertise. Very easy and fun way to understand how to use Facebook groups, my question is when you Join these groups, can they allow you to advertise in their groups? I Boost my pages and for some reason I cant explain, I have seen alot of acitivity in Google analytics and maybe got 1 Sell. What is Canned Sales Pitches and how do you make them or get them. Thanks really enjoyed the training. Every group will have their own rules for what you can share and how often. Always read the group's rules before you join and post within the group. A canned sales pitch is simply one that you create and share multiple times. It allows you to just copy and paste it instead of having to write up a new sales pitch each time you share your links. I have joined a number of different groups, the rules vary on whether you can advertise. I find out what the rules are before joining if I am going to advertise there. Thank you..Learnt something new Today..Appreciate your help. This training was really helpful! Can you tell me specifically what it is that you send them when they reply that they are interested? A link to your WA? or to your blog? And do you explain or just send them to a link? Would very much like to know! Thanks. I mix it up. Sometimes I send them a link to WA and sometime I send a link to my website. I always send a bit of text promoting the link along with a relevant image. But I never just post a link. This looks VERY powerful, and I'm itching to do it, but I'm hesitant about images; I don't know the rules for attribution, infringement, etc. in social media. If I have images I use on my WA site posts with HTML attribution or licensing lines at the bottom, can they be used in Social Media posts? If so, how do I deal with attribution/licensing? No your creation is your property so try to use yours or photos that are free to use that do not have any royalty in it. I do only use my own property, and free-use images that I find. However, most of the high quality free-to-use images that meet my needs require attribution or license links, which I drop at the bottom of my blog posts or pages. The format of WP sites makes that attribution easy. Not the same world at FB and other social media channels. You should always try to use your own if you have any or use images from free website directories. What is your niche about Steve? I use some of my own images, but mostly I use images from 100% royalty free websites, and most of them require some kind of attribution HTML at the bottom of the post. The posts I do require a lot of creative imagery, so creating or capturing my own takes too long for most of them. When you post to social media using your website link, the image is coming from within your website. There is no need to apply attribution because that already is being done within your website. Ok, I'm confused. Facebook will not let us join FB groups as a business page (correct?) If this is right, do I join the groups as a person through my personal profile page? Then how do I like or comment as my business? Do I share my links, posts etc through my personal page ? You have to join through your personal profile. Then when you share your links within that group, it will only appear in the group and not on your personal profile feed. Thanks, so I can join groups as myself on my personal profile, and then if the group allows, share my business page link? First off, I am not sure if this is the right place to post this, but I am a FB newbie. I am confused by the Business page. I created a FB account, and then I created a FB Business page. Everything seems to default to my personal page and my website name is listed as a shortcut on the left-hand sidebar. I am not sure if I did something wrong or not. I tried to follow some people, directly from their FB pages, and it's showing them on my personal page, not on my business page. Any suggestions? I have a training on how to follow people's FB page with your own FB page here: Like A Facebook Page As Your Own Page and A Way To Get More Facebook Page Likes See if that helps. Can I like personal pages or even join groups as my business page? I am definitely struggling to join groups in my niche as my business profile. Seems to only let me join ias my personal profile? You can only join groups with your personal account. Then you use your personal account to share your FB business Page to the FB groups. Hi there, I very much enjoyied this post . My website is a consultancy business specializing in helping beauty spa owners boost profits, so my customers are essentially business owners. Should I search for groups of salon owners and comment on their posts or should I start my own FB group. Can I have a FB group and a FB page and cross over both? I would first look for groups by salon owners. If you cannot find any then perhaps you can consider starting a group. Great training, and a good read, I hope to be as fluent with time and effort. Do you think that this is still current? As you have posted in Sep 2015 and FB has moved on quite a bit since then? I ask as I was considering making my own "Business" page and getting people to "Join". I look forward to any opinions you may have. Glyn looks like everything is pretty much current in this training. Some of the visuals might be a bit different now but all the methods still work. Yes, everything is still current and up to date, just not some of the visuals as noted by brokewebb. You have shown us three ways to posts in groups. You mentioned that with the first way of posting, you posted the same post for three days in three different groups. So does this mean that this same post is getting posted a total of nine times within a three day span? No. I only posted it 3 times and within 3 different groups, once per day. 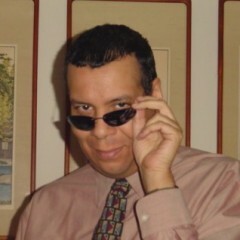 Robert, this is excellent training and as you well know I was having quit a bit of difficulty with posting in Facebook. After you helped me understand that there were way to many links in my WA review, I went back and removed over half of them. I then also waited to be excepted into the groups i'd applied to join (something else that you had explained would take a few days, I was just being to impatient). Then through following your training I was able to post my sales pitch with link into the groups. So in a very long winded way I would like to say thank you for your help. You are welcome Tommy. Glad things worked out for you. I am members of groups of all sizes, 70 to 100,000 members. You are welcome. FB Groups are the best way to get what you have in front of people within your target audience. Going to them is always better than waiting for them to come to you. Great training Boomer! What do you recommend in terms of posting frequency? Is once or twice a week okay? Once per day? Even more? I realize that every FB group has different guidelines - I guess I'm asking what group members would be more comfortable with (these would be posts to new articles on my blog, not hard sales pitches). Thanks! Like you state, it depends on the group guidelines. I will normally post 2 to 3 times per day but each time it is a different post with a different link. Never the same post within the same group within the same day. Cheers Boomer, I've been trying to get my head round this for some time and this answers a few questions. I am on facebook (personally) but to don't really know my way around. the posts that you put in groups, do they link back to a business (for the want of a better word,) page of yours or is it your personal page. I'd rather keep my personal account separate, is this possible? Sure you can link back and forth between group, business, and personal FB pages. Thanks for the reply but I'm not exactly sure what you mean. I want to keep my personal account separate, so am I better off creating a Facebook page that a can use to join groups? The posts I put into groups link back to my website or my affiliate link but it does not link back to my Facebook home page because I want to keep my FB home page as personal as possible. But I do post on my FB home page from time to time. Just looking at the examples you've put in your training, if someone was to click on your name (as opposed to your link) would they be taken to your personal account or a business page?